HomeUnion Reviews - Is it a Scam or Legit? By combining information from data scientists and professionals on the ground, HomeUnion can help you find, purchase, and manage rental investment property. You’ve probably wanted to invest in residential real estate for a long time, but all the hard work and heavy lifting seemed too overwhelming. 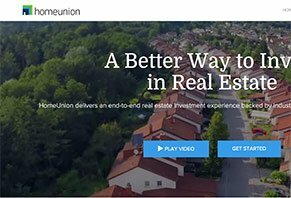 If you want to dive into real estate investing but don’t want to leave your house, HomeUnion delivers an end-to-end real estate investment experience—from helping you purchase a property to managing tenants. This can help you diversify your portfolio, earn good returns, and sit back and relax. But there are a lot of questions to consider before choosing HomeUnion, most which we’ll cover here. To begin, let’s take a look at exactly how HomeUnion works. After evaluating over 120 million 1-4 family homes and 200,000 neighborhoods, HomeUnion currently operates in 21 cities across 15 states. To assess which properties best meet your needs, you’ll answer a short, 3-question questionnaire before signing up for a HomeUnion account. Here, you’ll be asked questions like how much money you have to invest, how much risk you’re willing to take on, etc. HomeUnion will use this information to learn your needs and goals, and to create a personal portfolio tailored exactly to you. 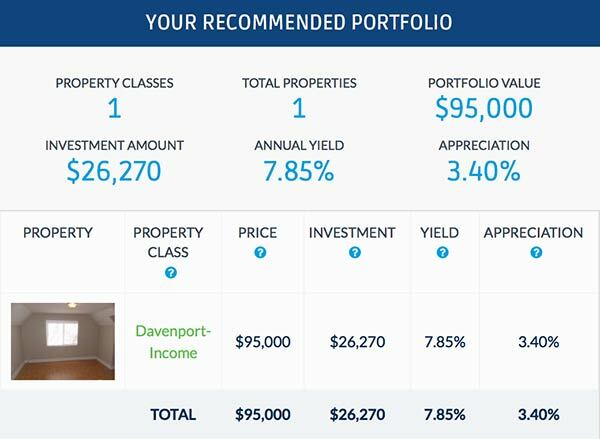 Then, you’ll be shown a “median” HomeUnion Property Portfolio, which will include key stats like overall value, investment amount, annual yield, appreciation, and more for properties that match your criteria. An example of what you’ll see after filling out HomeUnion’s short questionnaire. From there, you can tweak your portfolio’s settings by selecting certain locations, rental economies, investment goal, and more. If you want to save your results, you can open a free account by entering your name, contact information, and choosing a password. Once you decide to move forward, HomeUnion can help you purchase a property (whether through cash, and IRA, or a loan), find a renter, and manage the home (including regular maintenance and service calls from the tenant). While you own the home, you’ll also receive real time market analysis and monthly reporting on the performance of your investment. This will always allow you to know what your property is currently worth, and whether you should buy, hold, or sell. HomeUnion also claims to provide their investors with insider ‘first looks’ at new opportunities and markets, preparation of K1s, tax services (charges may apply), and other annual summary documents. HomeUnion can even help you sell when the time comes! Sounds like HomeUnion does a lot! What do they charge for all these services? No specific fee amounts were listed on the HomeUnion website, although the company claims to charge an asset acquisition fee (for obtaining each property) and an asset management fee (for the oversight and management of each investment property). HomeUnion provides warranties on all major appliances in your investment home. You’ll have minimum out of pocket expenses for maintenance visits, while your Asset Management Agreement covers everything else. HomeUnion will also perform routine property inspections to ensure proper upkeep, which can help prevent losses by detecting tenant misuse early. Finally, when viewing the numbers for a HomeUnion investment property, these are minus any expenses for property insurance, fees above, a 6% vacancy provision, and taxes. Are other investors please with what they’re earning through HomeUnion? Despite the fact that HomeUnion, based out of Irvine, CA, had been in business for more than 5 years, there wasn’t much investor feedback online. The single best source of information came from the Bigger Pockets thread noted in the previous section. There, several investors noted that the company does a thorough job of vetting investors, that the owners have a background in data, metrics, and systems from Oracle, and that they do most of the due diligence for you. HomeUnion had only been listed with the Better Business Bureau for a few months at the time of our research (again, despite the fact they’d been in business for more than 5 years), where they held an A+ rating with no complaints. Regardless of the feedback for HomeUnion, are single-family rentals a good investment strategy in the first place? Is Investing in Single-Family Rentals the Right Strategy for You? There are a lot of potential downfalls when dealing with a rental property, including procuring tenants, dealing with regular maintenance and late night emergency calls, collecting rent on time, and more. The good news is that companies like HomeUnion (and their competitors like Maverick, Norada, and Real Wealth) provide many of these services, although HomeUnion claims to be the only end-to-end solution. So in most instances, they can help you maintain all the advantages of real estate investing, while minimizing most of the disadvantages. Despite these advantages, what kind of return can you expect to earn on single-family rental real estate? According to a November 2014 post on HomeUnion’s blog, rental properties had an average rate of return of 9%, which is about 2 points higher than the average rate of return on stocks. In the real world, investors seem to be returning anywhere between 8% and 22%. Obviously this can change depending on a variety of market conditions. In most cases, investors don’t put all their eggs in one basket, which means that they’ll split their money between “traditional” investments like stocks, and alternate asset classes like real estate. This way, they can maximize their return and minimize their overall risk. This isn’t to say that investing in real estate doesn’t come with its own set of risks, but just like any other type of investing, there are ways to minimize your risk. Are HomeUnion’s Real Estate Investing Services Worthwhile? As with anything else, the value you receive from a service like HomeUnion largely depends on your overall goals. For example, if your goal is to invest in single-family real estate without searching for a property, rehabbing it (if necessary), locating tenants, dealing with maintenance, and more, a company like HomeUnion can prove to be invaluable. On the other hand, if you already know how to source a home (and a tenant), perform repairs, and deal with upkeep and want to maximize your profits, then self-managing rental properties might be a better option. So, if you’re looking for a more hands-off approach, HomeUnion seems to be a solid option. Just be sure to consult with your financial professional beforehand, and research other similar companies! My account manager, Jeff, doesn't respond to emails for weeks at a time. I just learned that HomeUnion is currently offloading their clients to other companies because they're getting so many complaints. What an incompetent company. Stay away. What a terrible experience. I mean terrible. HomeUnion is completely incompetent. From purchasing the home to managing the property, HomeUnion has made this experience a giant headache. Everything cost WAY more and took WAY longer than they projected. It took them two months to rent the place. When the tenants moved out a year later it took HomeUnion 45 DAYS just to tell me what the rehab cost would be. 45 DAYS of unnecessary vacancy! That's a loss of 10% of my properties annual earnings! My account manager Jeff Metz doesn't respond to emails for weeks at a time. And I just learned that HomeUnion is currently offloading their clients to other companies because they're getting so many complaints. What an incompetent company. Stay away. I bought three properties through HomeUnion about a year ago. Their management fees are very high relative to the local property managers I've used. This seems to be because they have a HUGE staff that lives in an expensive area of California and spends most of their time trying to market additional products to me, rather than manage the ones I am already paying them to! I never receive any funds until the last day of the month, and if the tenant pays any later than the 1st, they reserve the right to not pay until the FOLLOWING month (60 days later!). When rent is late, I receive NONE of the fees. These policies are non-negotiable. Tenants from 2 of the 3 properties have stopped paying rent after about 6 months. They just inform me that I won't be receiving payment. They don't start the eviction process or inform me of what is being done. It takes WEEKS for someone to get back to me. Terrible value. Do not invest with this company! They are egotistical jerks and border on scamming their investors. They provide you information, and if you have questions regarding their processes/fees, they get defensive. This is my experience. Some others may have had better experiences, however, as a novice investor, this is not the company I will be doing business and suggest others stay away. We applied for a home in Hazel Green, Alabama and never heard back from anyone. We paid an $80 processing fee and I feel SOMEONE could've at least called or emailed us that we were not approved (I'm assuming we weren't approved since it has been a month since we applied). I think $80 would be enough money to at least get something back. Very dissatisfied. Write a Review for HomeUnion!